Vista is a city in Southern California that was incorporated in 1963. Its population of 101,797 lives in an area of about 19 square miles. There are a number of major roads in Vista including Emerald Drive, Shadowridge Drive, Sycamore Avenue, Melrose Drive, Civic Center Drive, and Bobier Drive. If you were injured by a moving vehicle on one of these streets or elsewhere in town, an experienced Vista pedestrian accident attorney at the Rubinstein Law Group can help you determine if you have a claim for negligence. Pedestrians are vulnerable to the possibility of being hit by a car and injured whether they're walking through a parking lot or across the street. Unlike those ensconced inside a car, a pedestrian has no buffer to cushion the force of a collision, and may suffer catastrophic or even fatal injuries. Meanwhile, the driver of the car that hit them may continue on his way without even a scratch. To establish liability after a pedestrian accident, you'll need to show: (1) the defendant owed you a duty of care, (2) breach of duty, (3) causation, and (4) actual damages, and a knowledgeable car accident lawyer in Vista can assess whether your claim may meet these elements. All drivers owe a duty of care to others on the road. A breach of the duty to use reasonable care can happen in many ways, including by speeding, weaving, texting while driving, tailgating, driving aggressively, going around a stopped school bus, running a stop sign, or failing to follow traffic signals. Where, for example, a driver runs a stop sign, a pedestrian who has the right of way could be catastrophically injured or killed. It's likely in such a case that the driver would be found negligent and held accountable. Under California Vehicle Code section 21960, drivers are supposed to yield the right-of-way to pedestrians in marked crosswalks or at intersections. Drivers must not drive in safety areas under section 21709. Drivers that violate these code sections may be found negligent per se. In California a defendant is negligent per se if: (1) the defendant violated an ordinance, statute, or regulation, (2) the violation caused an injury or death, (3) the death or injury arose from an act that the regulation, ordinance, or statute was designed to prevent, and (4) the person that suffered death or injury was a member of a group the law was designed to protect. 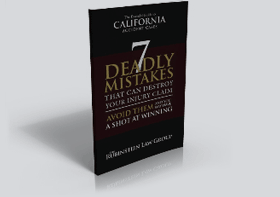 California follows the doctrine of pure comparative negligence. That means a plaintiff's own failure to use reasonable care will be taken into account by the jury. The jury will evaluate both parties' actions and determine damages. The plaintiff's damages will be reduced by an amount equal to her degree of fault. For example, a plaintiff who darted in front of oncoming traffic when she didn't have the right of way may be held partially or fully to blame for her own injuries. If, for example, her damages were $100,000, and the jury determined she was 50% at fault, she would be eligible to potentially recover up to only $50,000. A skilled Vista car accident attorney can help you continue to seek damages even if the defendant is attempting to blame you for your accident. Compensatory damages you may be able to recover after a pedestrian accident include both economic and noneconomic losses. Economic losses may include medical bills, lost wages, out-of-pocket costs, and replacement services, such as the cost of paying for household cleaners if you are no longer able to clean the house yourself due to injuries and disability from the accident. These are concrete losses, and are often documented. Noneconomic losses may include scarring, disfigurement, lost earning capacity, pain and suffering, mental anguish, loss of consortium, and loss of enjoyment. Noneconomic damages can vary widely depending on what the injuries are and what intangible harms the jury believes would naturally flow from them. An experienced personal injury attorney will try to find out all the ways in which your injuries resulted in harm and disruption to your life, and present a compelling story for insurance adjustors and juries in order to pursue the greatest possible compensation. If you were injured in a pedestrian accident in Vista, you should the Rubinstein Law Group may be able to help you hold the responsible party accountable. For a free consultation to discuss your case and any questions you may have about your accident, please call 866-771-7181 or contact us through our online form.